With the ZME100AC, Landis+Gyr has developed a meter for a broad range of applications: it focuses on the necessary functions and offers an excellent price-performance ratio – all without giving up the proverbial Landis+Gyr quality. The determination of the measuring values takes place via the optical interface on the handheld terminal. Alternatively, the S0 pulse output makes the connection possible not only in today's read-out systems, but also in future. 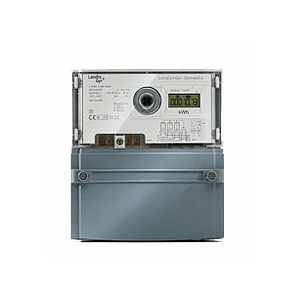 Furthermore, with a connection to an external communication module even the smallest household meter from Landis+Gyr is ready for the information technologies of tomorrow. A decision for the ZME100AC from Landis+Gyr is always a decision for high economic viability: simple installation, long life-cycle and high measuring accuracy. Protection mechanisms against theft give the billing process more security. Integration with additional meters from the Landis+Gyr portfolio is just as simple as accessing the service functions with the universal MAP software.